Late Sunday night on August 14, 2011, four burglars entered a Big Ed’s Restaurant in South Brunswick, NJ. Their cars parked outside the restaurant drew the attention of the police, and when the officers arrived they discovered an open door that led to the basement of the building. When they started to investigate, three of the burglars attempted to run away. 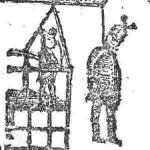 Two of the men were captured, including a man named Richard Wilson, but one of them remained at large. After the police secured the two suspects, they returned to the restaurant to survey the area. They found a considerable amount of copper piping that the burglars had cut out from the building and had piled up in preparation to load into their vehicles. As the officers continued to investigate the scene, they began to hear loud snoring noises coming from the top of a large refrigeration unit. When they looked up, they discovered another burglar from the group, who had fallen asleep after he went into hiding when the police first arrived. 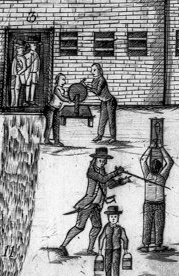 Almost three hundred years before Richard Wilson and his snoring companion broke into the Big Ed’s Restaurant, another Richard Wilson was caught committing burglary in Boston. While news of Richard Wilson’s burglary in New Jersey was reported on many websites–and his story may have even been broadcast on local television stations–only a few newspapers carried brief reports about the burglary committed by Boston’s Richard Wilson. 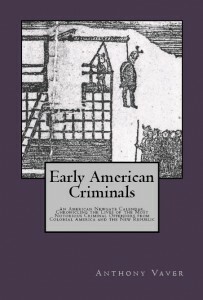 From these accounts, all that we know about the earlier Wilson and his burglary is that he was Irish and that he tried to steal “sundry Goods from Abiel Walley, Esq.” sometime in or around August, 1732. 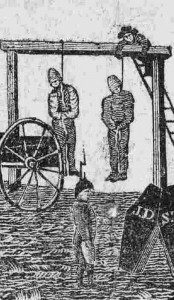 The Superiour Court sentenced him to death for his crime that month, and he was executed at Boston Neck on October 19, 1732. 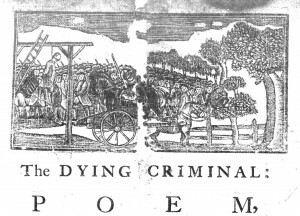 But along with these few reports, news of Wilson’s burglary and subsequent execution also appeared in one more media source: a poem in broadside form that was “Printed and Sold at the Heart and Crown in Cornhill” (a location that is now occupied by City Hall Plaza in Boston). 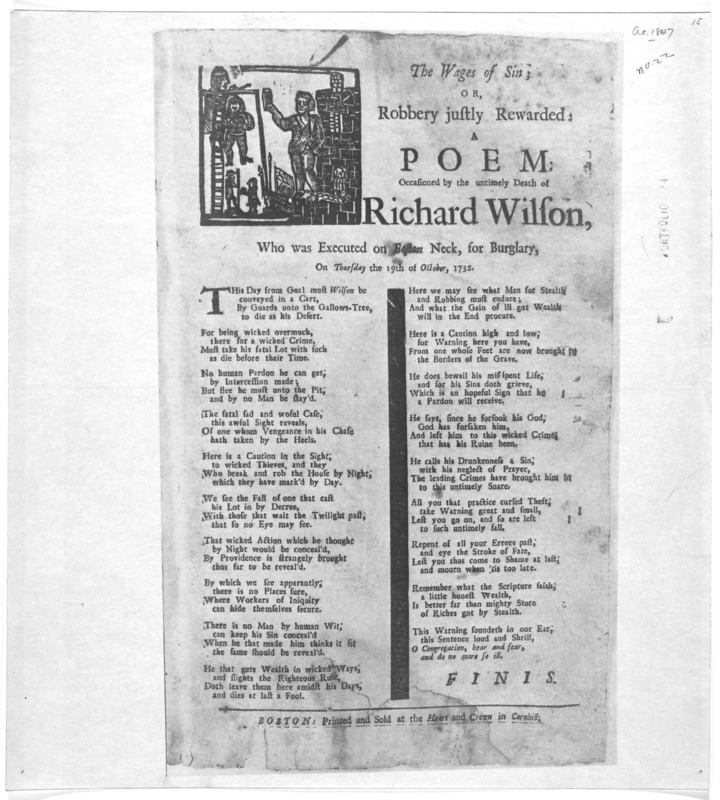 The poem does not fill in much more of the details of Richard Wilson’s burglary, but at the time it did help to disseminate news of his crime and punishment. On Thursday the 19th of October, 1732.
to die as his Desert. as die before their Time. and by no Man be stay’d. hath taken by the Heels. which they have mark’d by Day. that so no Eye may see. thus far to be reveal’d. the same should be reveal’d. and dies at last a Fool. will in the End procure. the Borders of the Grave. that has his Ruine been. and mourn when ’tis too late. of Riches got by Stealth. 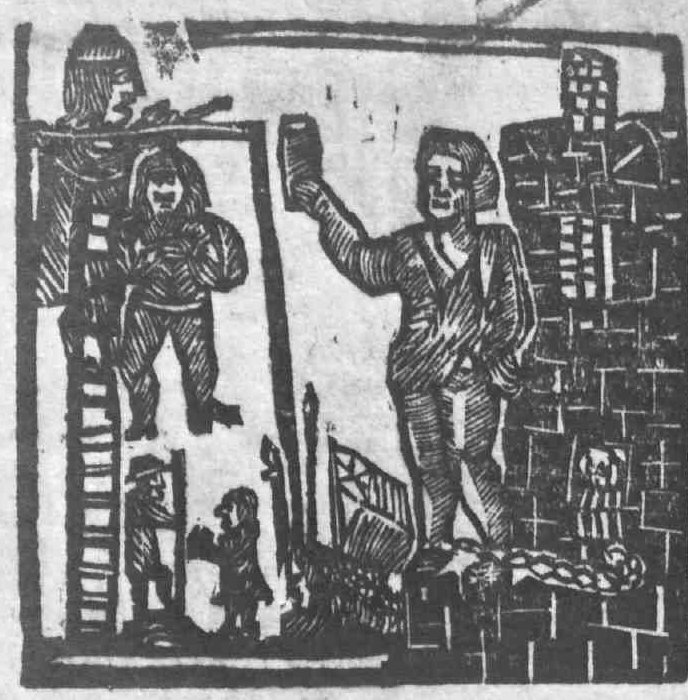 and do no more so ill.
American Weekly Mercury, Thursday, November 2, 1732, issue 670, p. 4. Database: America’s Historical Newspapers, Readex/Newsbank. “Boston, Aug. 21.” Weekly Rehearsal, August 21, 1732, issue 48, p. 2. Database: America’s Historical Newspapers, Readex/Newsbank. “Boston, Aug. 31.” Boston News-Letter, Thursday, August 31, 1732, issue 1492, p. 2. Database: America’s Historical Newspapers, Readex/Newsbank. “Snoring Burglar Tips Off Cops to Hiding Spot.” Website: NBC New York (http://www.nbcnewyork.com/news/local/Snoring-Burglar-Tips-Off-Cops-127754393.html). Accessed on March 26, 2012. 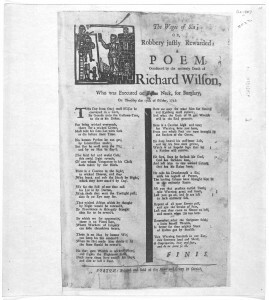 The Wages of Sin; Or, Robbery Justly Rewarded: A Poem; Occasioned by the Untimely Death of Richard Wilson. Boston: Printed and Sold at the Heart and Crown in Cornhill, . Database: American Memory, Library of Congress: http://hdl.loc.gov/loc.rbc/rbpe.03402200. 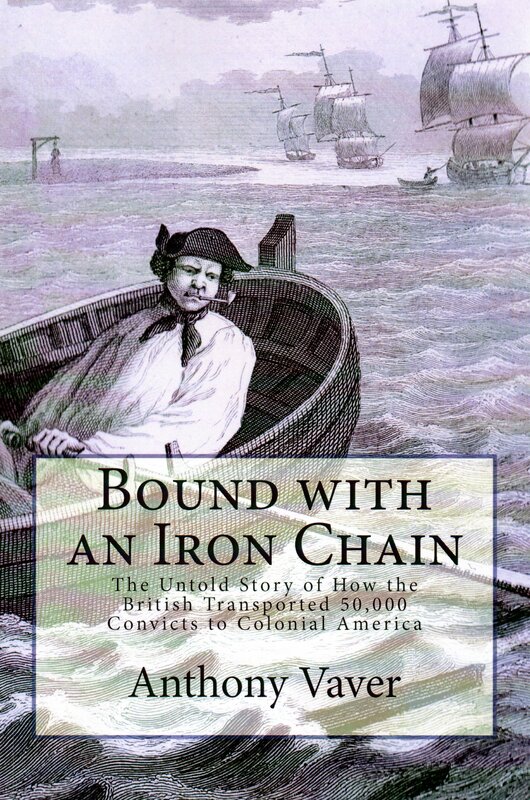 If you enjoyed this website, try reading my two Amazon.com bestselling books, Early American Criminals and Bound with an Iron Chain: The Untold Story of How the British Transported 50,000 Convicts to Colonial America. Visit Pickpocket Publishing for details. This was written by Anthony Vaver. Posted on Wednesday, March 28, 2012, at 10:52 am. Filed under Poems. 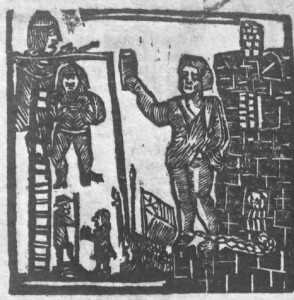 Tagged Burglary, Execution, Massachusetts, New Jersey, Punishment. Bookmark the permalink. Follow comments here with the RSS feed. Post a comment or leave a trackback.